Some time ago I purchased an external RAID enclosure to use as a Time Machine backup drive. The model was the Vantec NexStar HX4R Quad 3.5 Inch. I’d strongly advise AGAINST this model for reasons outlined below. Over the course of using this device I had no fewer than 6 drives fail on me. 3 WD green drives and 3 WD red drives. After six drive failures I was certain I couldn’t be THAT unlucky and sent the enclosure back. I wasted days trying to trouble shoot the issues and rebuilding RAID arrays (and repacking up my time machine data each time). Since the array would seemingly work for a few days, even weeks before failure I had initially suspected the hard drives were to blame. In the course of trouble shooting what might have gone wrong I took one of the hard drives out of the array and put it into a USB hard drive dock. Something strange happened upon doing this. My 3TB hard drive started showing up as only 800TB. This happened with multiple drives. Initially I thought it was something to do with the RAID enclosure. I reformatted multiple times and tried it on multiple machines. It continued to only show up as 800GB. Eventually I installed it as an internal drive and formatted. This time it showed up as 3TB. So it wasn’t the RAID causing the drive to show up as 800GB (although the RAID DID completely corrupt several hard drives), it was the USB dock. (A Wellard SunBright External eSATA dock in this case). Apparently the chipset in the dock only supported drives up to 2TB. As you may know you don’t really get 3TB of usable space on a 3TB drive, so after the excess was skimmed off the top, it took 2TB and left 800GB remaining as the visible volume. While still trying to trouble shoot the RAID, I figured I’d just buy a new hard drive dock. However, after looking around, it appears that even today most USB hard drive docks still only support 2TB drives. So, if you’re experiencing drives not showing up anywhere near their full capacity while in a dock, and the drive is more than 2TB, that could be the reason. 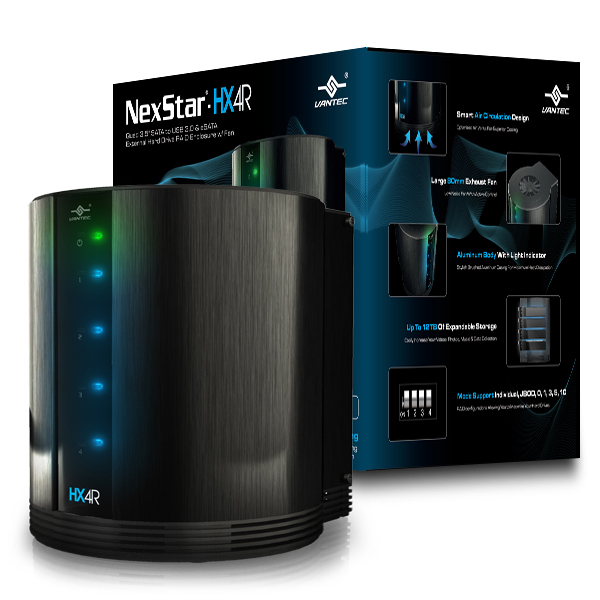 Eventually the Vantec NexStar HX4R RAID enclosure got sent back and I purchased a Hotway HFR2-SU3S2FW 4-Bay USB 3.0/eSATA/Firewire RAID instead. I run 4 of these at work and they haven’t missed a beat (despite being rather slow). Lesson learned: you can buy cheap RAID enclosures, but not THE cheapest.